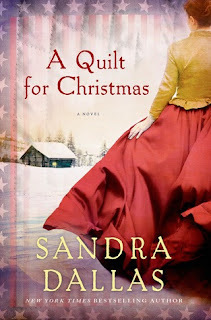 In Sandra Dallas' novel A Quilt for Christmas, it is 1864 and Eliza Spooner's husband Will has joined the Kansas volunteers to fight the Confederates, leaving her with their two children and in charge of their home and land. Eliza is confident that he will return home, and she helps pass the months making a special quilt to keep Will warm during his winter in the army. When the unthinkable happens, she takes in a woman and child who have been left alone and made vulnerable by the war, and she finds solace and camaraderie amongst the women of her quilting group. And when she is asked to help hide an escaped slave, she must decide for herself what is right, and who can she can count on to help her. I was immediately drawn into the lives of the people in this novel, in fact I hadn’t been expecting to be so fascinated and I was impressed with Sandra Dallas’ writing style because the era could have seemed cold due to the war and difficult times. I don’t know much about the era except the basic facts but I’ve probably always been interested in the lives of early settlers in North America due to my childhood obsession with Laura Ingalls Wilder novels. I found the relationship between Will and Eliza so charming, so sweet and so practical. Yes, practical. You were given snippets of their relationship through letters and though the love and admiration was always present there was also a great sense of their functionality as a couple to run their farm and to get things done. I admired her immensely as the novel continued and her life changed so abruptly. The other characters in the novel rounded out the story of the family perfectly and the quilting circle particularly gave me a sense of Eliza as a woman and as a friend. The little tidbits of information about quilting, the stitches, the patterns and the planning were just about my speed- I admire quilters greatly but think my patience level is lacking to actually make one myself. The novel was short with so much packed into it and I was really happy with the outcome.